Updated at 4:40 p.m. with comment from the Education Department inspector general’s office. 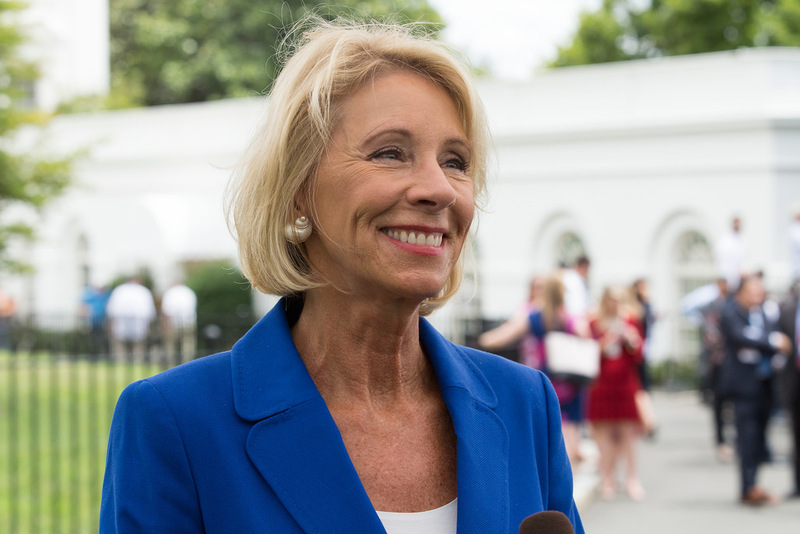 The Trump administration has walked back a decision to replace the U.S. Education Department’s internal watchdog after lawmakers assailed Education Secretary Betsy DeVos for the unusual move. Following reports this week that the U.S. Education Department would replace its acting inspector general with the agency’s deputy general counsel, the White House reversed course on Friday, an Education Department spokeswoman told the Michigan Advance. “After the designation of the Acting IG was made, the matter came to the attention of new personnel in the White House. After they reevaluated the situation, the decision was made, in an abundance of caution, to rescind the designation,” department spokeswoman Liz Hill said in a statement. As the Advance previously reported, DeVos, a member of the billionaire Grand Rapids family that gives heavily to Republicans across the country, is under increased scrutiny on Capitol Hill now that Democrats control the U.S. House. The move this week to abruptly replace acting Inspector General Sandra Bruce with the department’s deputy general counsel, Phil Rosenfelt, immediately sparked a backlash from lawmakers and advocacy groups concerned about the independence of the Office of Inspector General (OIG). “We are concerned that the installation of Mr. Rosenfelt as Acting Inspector General would impede the ability of the OIG to conduct its critical work due to conflicts or appearances of conflict,” Democratic lawmakers wrote in a letter to DeVos on Friday. Politico reported about the plan to replace Bruce with Rosenfelt earlier this week. The White House did not immediately respond to a request for comment about the personnel decision. The Education Department’s press office didn’t respond to a question about why the decision was made in the first place. Like other large federal agencies, the U.S. Education Department has an independent internal watchdog charged with rooting out waste, fraud and abuse. The inspectors general are appointed by the president and subject to Senate confirmation. The last U.S. Senate-confirmed IG at the Education Department was Kathleen Tighe, a former President Barack Obama appointee who resigned late last year. This isn’t the first time the Trump White House has come under fire for reports that an acting inspector general would be replaced. In October, reports surfaced that a top political official at the U.S. Department of Housing and Urban Development would replace the acting inspector general at the U.S. Interior Department as then-Interior Secretary Ryan Zinke was facing multiple investigations. The U.S. Interior Department later denied those reports and the official said to have been in line for the Interior watchdog job resigned from the U.S. Department of Housing and Urban Development.